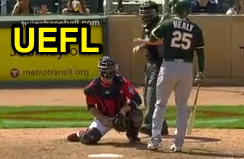 HP Umpire Mike Muchlinski ejected Athletics 3B Ryon Healy (strike three call) in the top of the 8th inning of the A's-Twins game. With one out and the bases loaded, Healy took a 2-2 curveball from Twins pitcher Ryan Pressly for a called third strike. Replays indicate the pitch was located over the inner half of home plate and below the midpoint (px -.701, pz 3.056 [sz_top 3.411]), the call was correct. At the time of the ejection, the A's were leading, 6-3. The A's ultimately won the contest, 8-5. This is Mike Muchlinski (76)'s second ejection of the 2017 MLB regular season. Mike Muchlinski now has -2 points in the UEFL Standings (-4 Previous + 2 MLB + 2 Correct = -2). Crew Chief Mike Winters now has 3 points in Crew Division (2 Previous + 1 Correct Call = 3). *The Kulpa Rule begins at px value |.748|. Related Video: R1, R2, 0 out, 9th, 8-5 game: Muchlinski takes a direct groin shot from A's pitching. This is the 25th ejection report of 2017. This is the 10th player ejection of 2017. Prior to ejection, Healy was 2-5 (3 SO) in the contest. This is Oakland's 1st ejection of 2017, T-2nd in the AL West (TEX 2; OAK, SEA 1; HOU, LAA 0). This is Ryon Healy's first career MLB ejection. This is Mike Muchlinski's 2nd ejection of 2017, 1st since April 9 (Kevin Kiermaier; QOC = N [B/S]). Wrap: Oakland Athletics vs. Minnesota Twins, 5/4/17 | Video via "Read More"